Streetsblog received word last night from Jonathan Weiss that the proposed bicycle lanes on Westwood Boulevard between Pico Boulevard and Santa Monica Boulevard are opposed by local City Councilmember, Paul Koretz. 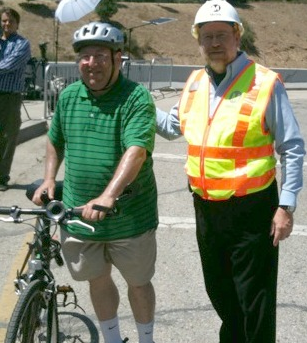 Weiss serves as Koretz’ appointee to the City of Los Angeles Bicycle Advisory Committee. This news comes as a blow to cyclists that use Westwood Blvd. every day to commute to and from UCLA and other destinations. Bicycle lanes already exist south of National Boulevard and north of Santa Monica Boulevard, making this an obvious connection in the city’s Bicycle Plan. The UCLA Bicycle Coalition and LACBC organized “Ride Westwood” to support the connection. However, after the Los Angeles Department of Transportation held a public information session that turned senselessly raucous, the future of the lanes seemed uncertain. Our coverage of the meeting even led to a lively segment on the local conservative political talk radio show John and Ken on KFI 640 AM. It is wildly unlikely that the city will move forward with a bicycle lane project without at least tacit support from the Council office, which is bowing to pressure from homeowner groups that have been hostile to transportation options outside of the automobile. One homeowner group, the “Westwood South of Santa Monica Blvd.” homeowners, even formed a “bicycle committee” which met three times, received a long and well-researched report on why the Bicycle Lanes should be put on Westwood Blvd., and then circulated a letter opposing even studying of a design proposal to make lanes less obtrusive. NYCDOT Commissioner Janette Sadik-Khan likes to remark that projects that are aimed to improve mobility for all road users should be first explained as safety projects. After all, who can argue against safety? Apparently, the Westwood South of Santa Monica Homeowners Group can. In her eloquent and well researched series (part I, part II) on bicycle safety on Westwood Boulevard, Calla Weimer shows that the stretch of Westwood Boulevard where the lanes are proposed are among the most dangerous blocks to bicycle in the city. After providing context, Weimer digs deeper to use more data to show the highly dangerous situation on Westwood right now. Skeptics might still counter that the six collisions in 2011 were a statistical aberration. Such a short stretch of roadway is subject to a high degree of variability in collision rates from year to year, after all. But even if we take the average number of cyclist collisions over the three year period 2009-2011 to represent the statistically expected number of collisions in 2011, the count still comes to four. On a per mile basis, that number yields cyclist collisions for the WSSM stretch of Westwood Blvd at a rate 21 times higher than for LA County as a whole and a share of cyclist collisions relative to all collisions at a rate 3.2 times higher. But this homeowners group doesn’t just write the write against better information on bicycle safety, they also call the cops. The following email was sent, without irony or shame, from the homeowners group to residents earlier this month. Many residents were disturbed by a person with a backpack and a bicycle, seated on the curb at Prosser and La Grange all day and evening. It was especially unnerving after reports of two young men on bikes casing homes in our area. It turns out that a Bike Group at UCLA assigned people to count bikes at that corner without the most basic courtesy of notifying residents or the HOA or the Council office. Police resources were unnecessarily wasted, and residents were unnecessarily upset. That’s right, if you’re doing bicycle counts don’t forget to call the Homeowners Association, the City Council Office, and the police to make sure you don’t upset someone vigorously clutching their pearls. These are the people Paul Koretz is listening to. Studies, road conditions and safety be damned. When:Thursday, November 14 at 6:30 pm. It became very clear to me what council member Paul Koretz would do about installing bike lanes on a major arterial after what took place for installing bus only lanes in parking lanes along Wilshire Blvd during peak hours only. He turned it down after constituents loudly voiced their opinion against it. Why would installing bike lanes be any different for him? Its pretty clear that residents in the area are against any change that would infer giving space to anything other than cars on streets and it doesn’t matter if it would have absolutely no negative impact on driving. Increasing the mode share for bicycling in that area has to come mainly from connecting residential streets into a useful network of bike routes. Westwood seems to be a massive CBD surrounded by neighborhoods that want to be a part of Newport Beach and never have to see pedestrians,cyclists, transit or respect crosswalks. Another reason why LA will never be a place worth living. There seem to be many, alternate paths through the residential side streets (which run parallel to Westwood Blvd) which would not only provide a route for the daily bike commuter population (some believe is quite small) who seem were very interested in these bike lanes, but also such routes could better serve a wider portion of the community. That is, not just daily commuters, but bike riders intimidated by the thought of riding next to with heavy traffic with or without lanes, children, etc. Also, pursuing alternate routes away from Westwood Blvd. would separate the bike and auto traffic much more than a lane would, which would seem to make for a safer bike ride in general. Clearly, there are no such alternate routes today (other than Veteran which gets more than its share of auto traffic) because of crossing at major east/west streets like Olympic and Santa Monica. But if such crossings existed, it seems like there is a viable north/south path which could serve not only cyclists of all skill levels and use cases but also have beneficial side effects like discouraging/slowing auto traffic on those same residential streets. Lastly, regarding the last portion of your post regarding an email about potential suspicious activity, it is a bit difficult to correlate to the main topic of the post. However, there are regular incidents of “knock, knock” burglaries in many areas of West Los Angeles (not to mention all of California and nation wide I believe). The community uses Neighborhood Watch techniques to try and report suspicious behavior and slow/stop this crime activity. I read the excerpt you refer to above as a resident seeing unfamiliar people sitting in a neighborhood for a significant length of time, and interpreting that as scouts for the burglars. I would not expect that the call to police had anything to do with the fact these people had bikes. Note, when LACBC conducted their bike count, they handed out neon T-shirts with a printed motto related to the count and specifically commented that these were to let the public readily identify that bike count participants were engaged in an large organized effort. And with the T-shirts, on many people spread all over town, the average resident would understand the count participants were not just strangers observing the neighborhood as that would appear suspicious. Hopefully that helps to expand the viewpoint here. This is the first time I heard of a LADOT proposal to install bus lane (bikes ok!) on Westwood! When was this study done and is it available for review? I know you say it is DOA but I think it is sad commentary on the kind of ridiculous politics surrounding the efforts to allocate road space to the majority of users. This stretch of Westwood Blvd has FAR higher number of bus riders than car drivers during rush hour and yet, our politics are still stuck in given car drivers cart blanche right to hog as much space as possible. Why should the bicyclist bear the burden of detour? Using that logic, only bus riders should get to use Westwood Blvd since they are the majority user. Single occupant cars should detour through residential streets. Yes? I use Westwood because it is the ONLY route that goes through the Exposition rail right-of-way, Pico, and the Westside Pavillion mall. These are geographical barriers that I have to get past somehow. My regular commute is now 3.7 miles. If I took Military-Veteran to the west, my trip would be 4.2 miles. If I took Prosser to the east, my trip would be 4.5 miles. Both alternatives would add many hills as well. For someone in a car, these may sound like trivial differences, but for someone who wants to commute from Palms on a bike, the added difficulty involved will be far from appealing. These alternatives might be just fine for folks who are already north of Pico. The bottom line is, all of these options should be available and safe for people who live along the whole distance of the Westwood corridor. Giving up on Westwood is not an inclusive solution. As you say, Military goes through as well. I understand you’d prefer to keep your commute as short/straight as possible, but its obviously a difficult area or this discussion wouldn’t be under way. There are many factors to consider. I feel a compromise needs to be found taking more than just route length into consideration. Assuming from Military, you could just ride up one of the parallel side streets just west of Westwood (e.g. Veteran, Kelton, Midvale) what/where is the additional climb as compared to Westwood? I know Veteran has a decent hill just north of Santa Monica, but isn’t that about where Westwood’s incline increases as well? Alternatively, if you could bypass Westwood then get back onto it north of SM (not saying I can see how that is readily done) does that still incur a big delta in the incline? Understood its a detour east/west. To be fair, Westwood isn’t to be declared “no bike access” now. It will still an option to bike as it is now (without lanes). I realize that makes it less appealing as compared to it with lanes. Their are a multitude of parallel routes to every street. Why is it that drivers should be provided high quality direct access to their destinations but you feel bicyclists should travel on parallel routes out of their way to get to the same places you want to go? It is much easier for a car to do this than a pedestrian or bicyclist. Stop being lazy and opposed to something that might cause you slight inconvenience. Its not about laying a burden on bike riders nor is it just about the commute traffic along Westwood. This conversation is also about the businesses, and the surrounding residential community including those who ride bikes (of all skill levels and for a number of reasons other than commuting to campus/work) as well as those who do not ride. My suggestion is to find an alternate route using the residential side streets. One of many reasons being the last thing residents on those streets want is more auto traffic. So prioritizing the bikes on Westwood may result in cars going into the residential streets which makes for an unpleasant and dangerous neighborhood environment. I think these same residents would encourage bike traffic because it has less impact on the residential community and would discourage auto traffic on those streets. That’s a argument for routing the bikes down the side streets. As I assume you don’t live there, I can understand how you would see this as a burden to you with no benefit. I don’t have a good response to that unfortunately. To offer another perspective, when I ride (and likely not as often as many who will post here) I intentionally avoid streets with a lot of auto traffic and seek out residential routes. I have a friend who cycles much more than I (he rides centuries relatively often) and he does the same. Granted, we could both probably be characterized as “recreational” riders, not daily commuters. We wouldn’t see adjusting to a non-direct, residential route as a “burden on the bicyclist”. Its the tradeoff to find a “better” route where length of the ride isn’t the top priority. In that sense, its not way out of line to assume many bike riders would find a route through residential streets preferable. Keeping Westwood EXACTLY AS IT IS TODAY is NOT a “compromise.” A watered down solution that disappoints both parties because they don’t get exactly what they want is a compromise. Also, opponents to bike lanes on Westwood who favor “alternate routes” neglect to take into account safety. The Bike Plan calls for action on Westwood. Bike advocates want something on Westwood because the street isn’t safe. Everyone benefits from improved traffic safety that comes along with bike lanes. Isn’t the suggestion to route bikes onto roads with minimal automobile traffic something which would improve bike rider safety? The alternate suggestions I made are not keeping Westwood exactly the same. They imply adding bike only crossing at major intersections. I don’t recall any discussion related to traffic light re-syncs. How does that help here? Is 12mph the average speed for the bike commuters or something? I am pretty sure I’ve seen bike riders heading south on Westwood (the downhill portion) moving significantly faster than that, even when there is dead stopped auto traffic right next to them but maybe my ability to judge speed isn’t as good as I recall. If I’m correct, and you slow all the traffic to 12mph, won’t that annoy/anger some of the bike commuter population as much as taking a detour to an alternate route? A green sharrow lane sounds akin to the floating lane? What’s the fundamental difference? Just because the bike plan says a road is to have improvements on it, doesn’t mean those improvements make sense when you look closer. Today, there is no alternate route other than Sawtelle, Sepulveda, Veteran, and Overland (more if you go much farther east/west out but clearly those are less realistic). Those are the only streets (other than Westwood) that have controlled crossing over Olympic, Santa Monica, etc. Without those controlled crossings, there’s no hope for a bike rider to go north/south. Not a commuter (I assume you are a daily commuter) or an occasional rider like myself who say just wants to go to Bella Pita for a sandwhich. My point is an alternate route could be created if bike/ped only crossing were installed along one or more of those side streets (say Midvale) at the major crossings (Olympic, Santa Monica). It would take some creativity but I see multiple possibilities. These alternates are not as simple as painting and re-striping Westwood, I get that. They also won’t be cheap, I get that as well. But they are worth looking at in my opinion as I think they offer a better overall compromise than Westwood lanes. Safety problems do not exist on parallel residential streets to the extent that there are safety problems on Westwood. That is, keeping Westwood as it is does nothing to improve safety on Westwood– and that is where traffic collisions occur. Re-routing cyclists may reduce the number of people biking on Westwood but it fundamentally does nothing to make Westwood safer for biking (or any other travel mode), which is sort of the whole point. A 12mph light synchronization allows for effortless biking as people won’t be stopped at every other intersection and instead get a wave of green lights. Some cyclists undoubtedly go faster than 12mph but for those of us that want to get where we want without sweating, 12mph is plenty fast, especially if we don’t need to stop at a red light every other block. The “clutching pearls” comment at the end of the post is not appreciated. Our neighborhood is being hit with a slew of robberies, and the best information is that pairs of bicyclists w/backpacks are casing homes during the midday and then busting in the side doors if no one is home, grabbing whatever fits in the pack, and biking off. My block alone has had 2 robberies and 1 attempt in the last 4 weeks. So go clutch your own pearls – sorry you hate our neighborhood. Sam I live in the same neighborhood as you, beset by the same robberies. I also ride a bike. Frankly it is “pearl clutching” a whole lot of it. I’m talking specifically about the last 11 lines of the post, which is an ill-informed cheap shot. Very few people are willing to ride a bicycle in mixed traffic on a busy street. I also don’t see the potential for the brilliance of any argument persuading the majority of the stakeholders in that area to a different point of view. Their fear of change would override any well thought out reasoning for it. Agreed, I’m no big fan of green sharrow lanes. My point is that a compromise would mean doing **something** on Westwood as opposed to nothing. Sending bicyclists off to a different street (while it may be practical or even helpful to some extent) is not a compromise, it is simply a separate situation altogether. Sure, create a parallel route, though this does not preclude the need for action on Westwood itself. If we want to improve safety on Westwood, this can hardly be done by implementing something on a parallel street– Westwood remains as dangerous! If Westwood were perfectly comfortable and safe, then there wouldn’t be a call for bike lanes on the street in the first place! How anyone can construe that a person with a backpack and a bicycle that is sitting on the curb using a clipboard could be associated with a string of robberies in a neighborhood is unfathomable. The last thing you would want to do as a robber is make yourself noticed by sitting on the curb for two hours. Why didn’t the person in the neighborhood who called the police simply walk up to the person with the clipboard and ask them what they were doing instead of calling the police first? We need to stop listening to NIMBY’s and start listening to UCLA. One of them acknowledges we need to change our habits if we are to stand a chance against climate change and the other doesn’t. LADOT Ready to Embrace “Floating” Bike Lanes for Westwood, But Is West L.A.?